In the summer of 2006, TwoPints and I traveled to Delaware with Milton and Rehoboth in our crosshairs. While in Rehoboth, we serendipitously connected with 90 Minutes/30 Days. The brewery describes it as a "special brewpub-only release... We aged three kegs of our 90 Minute IPA in Pinot Noir barrels stuffed with Amarillo hops for 30 days - hold on to your hats!" It was a game changer. Something to write home about. Seriously, I would have tweeted the moment... if that existed back then. On our 2nd visit in as many days, we ordered the last pint of 90 Minutes/30 Days and thought nothing of it (but the sadness that the next round would have to be something else). It turns out, this was the last (only?) version that was ever brewed. It was one of my favorite draft beers I've ever had. A big, belgian-style Wit brewed with coriander and orange peel and fermented with Pinot Noir juice. After fermentation a fraction of the batch is aged in Oregon Pinot Noir barrels, and another fraction is aged on oak staves. The beer is blended together before packaging. This has been one of our most popular Limited Edition beers at both our Rehoboth Beach, DE brewpub and at festivals. It successfully marries the refreshing citrusy qualities of a Belgian-style white beer with the robust complexity of a bold red wine. Tonight started with a few glasses of Havens at my parents' house while picking up the kids. Once home, the evolution to a Dogfish Head Red & White for Day 3 of American Craft Beer Week was inevitable. Sam Calagione may be a lot of things to to the craft brewing world, but in my opinion, his beers epitomize flavor balance. 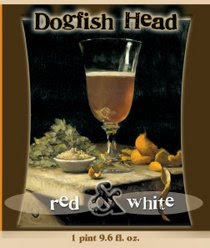 Quite simply, Red & White is a beer that blends wine (red) with a Belgian Wit beer (white). Personally, I don't really detect the Pinot flavor, but seriously, do you want this to be the dominant flavor in your beer? The wine and oak flavors are best kept in the background. Frankly, this beer does not remind me much of a Wit either, but maybe that is due to the multifaceted blend. The sugary Belgian flavors and are prevalent and compliment the beer nicely. The beer is complex, delicious, but not quite an equal to 90 Minutes/30 Days. But I'm Amercian (unapologetically by birth). I like hops. I can't help it. drinking you is always a treat. leaving me to drink much more. finding our prized Red and White down the row. I'm so ready for another pour! to bring us this awesome Limited Edition. I'm not one to write poetry, but I was inspired by this Limited Edition Belgian-style Wit beer. I love the sweet beginning and the bit of a bite at the end. If you roll it around your mouth you can taste the coriander, which happens to be a flavor that works well with orange, another ingredient in this DELICIOUS beer (Oh uh there goes the SHIFT key again!). There is no way that I couldn't be a fan of this FANTABLOUS beer, not only does it taste great but one of my favorite brewers created it (SirRon is my ultimate favorite). Two pints up to Sam and Dogfish Head for keeping it "off centered" ............ oak barrels... GENIUS! Sounds like it takes a real flavor balance expert to get this one right. Can I get this at my local Specs? While it lasts... Specs has had quite a bit on the shelves recently. Much more than in previous years. There's a shtload of Red & White in Dallas still, I've already got three bottles.